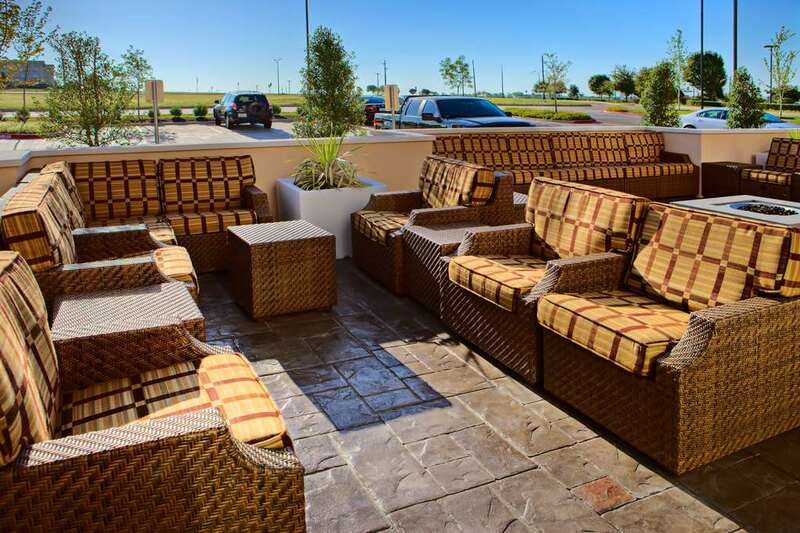 The Hilton Garden Inn DFW North Grapevine hotel is nestled between Dallas and Fort Worth Texas just three miles north of DFW International Airport. Stay at this hotel and be within minutes of major corporations such as CAE Simuflite Flight Safety and Bombardier. more than 180 restaurants offering local favorites and international cuisine. shops and recreational facilities. Enjoy events at The Gaylord Texan shopping at Grapevine Mills Mall and Bass Pro Shops Outdoor World and activities at Lake Grapevine or Dallas Cowboys Golf Club near this North Grapevine Texas hotel. Ten wineries and tasting rooms are also nearby. Choose from 110 guest rooms and suites each equipped with a spacious work desk with an ergonomic Herman Miller Mirra chair high-speed internet as well as remote printing provided by PrinterOn. All hotel rooms feature a hospitality center with a microwave refrigerator and coffeemaker as well as a large flat-screen HDTV and a wide variety of channels. Iron ironing board and are standard in all rooms at the Hilton Garden Inn DFW North Grapevine Texas hotel. Our restaurant The Great American Grill serves a full cooked-to-order breakfast daily and offers room service for your dining pleasure. Unwind with a drink in the full-service cocktail lounge. The Hilton Garden Inn DFW North Grapevine provides complimentary 24-hour transportation to and from DFW International Airport. The hotel also has a 24-hour complimentary business center. Relax in the indoor saltwater pool or work out using the fitness center*s modern equipment. Everything. Right where you need it. The Garden Grille: The Garden Grille located here at our Hilton Garden Inn features a breakfast buffet with fresh bakery breads seasonal fruits cereal pancakes waffles eggs and cooked-to-order items. In the evening the Grille features uniquely-prepared American cuisine available in the dining room or through room service. The Garden Grille - Bar: The Garden Grille is located just off of the first floor lobby area and is open 7 days a week for dinner. The menu offers a wide variety of upscale dining options that is available for evening room service as well. Pavilion Pantry: The Pavilion Pantry 24-hour convenience mart located here in our DFW Airport hotel offers an assortment of refrigerated frozen and microwavable packaged items. Guests can prepare these items in the comfort of their own rooms using the in-room microwave and refrigerator.